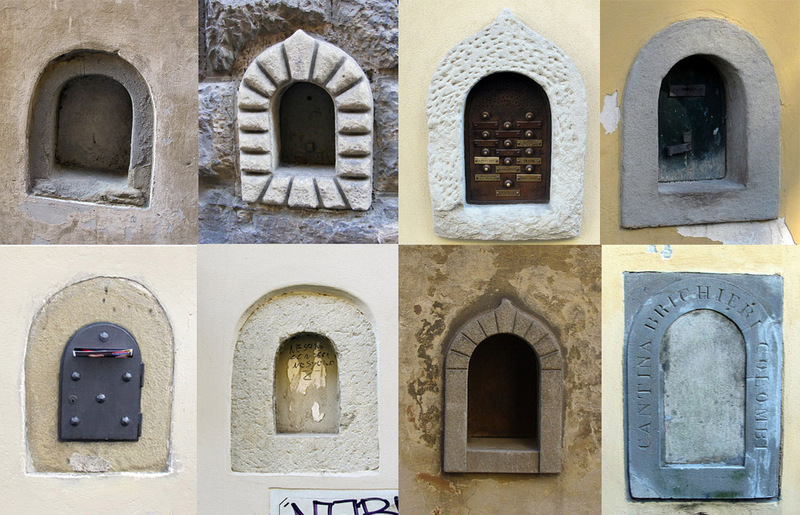 For many centuries, a surreptitious trade of wine was conducted through these tiny windows. A customer looking to buy wine would knock on the door, whereupon the cellarman or porter appointed by the owner of the house would open the door from the inside. The customer would slip a few coins into the hands of the cellarman, and in return, he would hand the customer a flask of wine. Many noble families of Florence, who had grand palazzos in the center of the city, also had their own vineyards outside of the city walls or in the countryside. 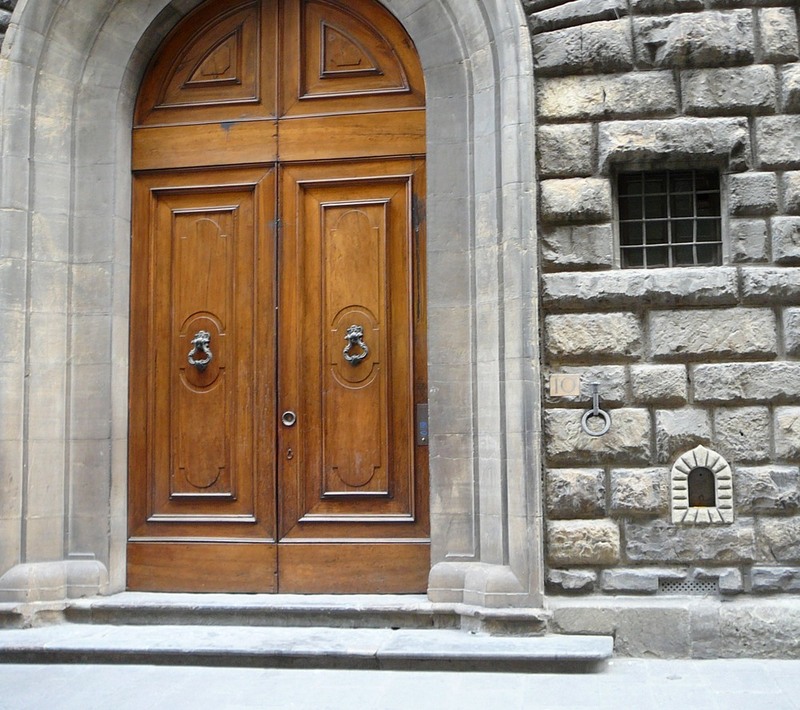 These Florentine palaces would store their foodstuffs, including wine and oil, in the basement or cantina. Instead of selling their produce openly on the market, these wine producers devised a method of selling directly to customers to increase their profit. They installed small windows opening out into the streets at about the level of a pedestrian’s waist. These windows opened directly into the cellar where wine was stored. Customers brought their own jug, bottle or glass, placed them through the small window, where it was filled up, money was exchanged and the transaction was completed. 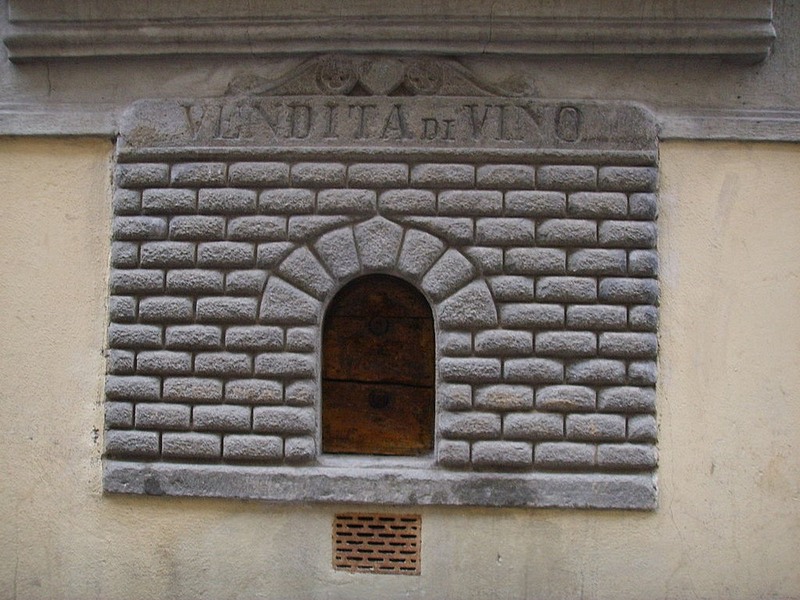 These windows came to be known as “wine windows” or “buchette del vino”. Eventually, many other products such as olive oil, cured legs of pork, bags of flour, and baskets of vegetables were sold through the wine windows. Sometimes benevolent families would give out food and wine for a poor person to enjoy through the windows. All a person had to do was knock on the door. The practice of selling wine through wine windows probably began in the early 16th century after the Medici family returned to power and the wine producing syndicate gradually began to fail. The first documents describing the direct sale of wine in the palaces of the families who produced them dates back to 1559, but it does not mention the existence of the wine windows. At one time, there were hundreds of wine windows distributed throughout the city. The Wine Windows Association have identified more than 150 windows still in existence, although you can no longer buy wine through them. Most of them are barred shut. Others have been bricked up permanently.